31 years old Chrissy Teigen suffers wardrobe malfunction which accidentally flashed her mammary glands. 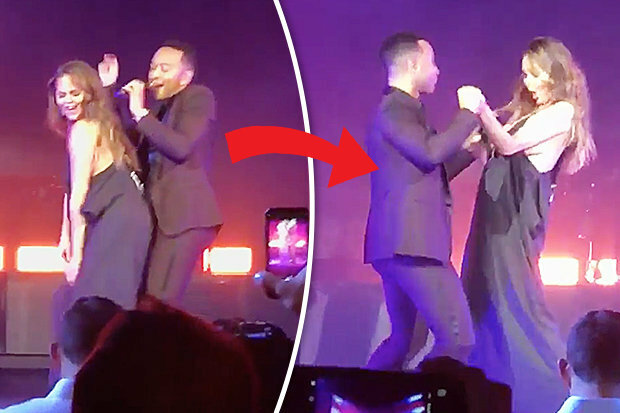 She headed for the stage to join husband John Legend at Madison Square Garden in New York for a dance number with him. Both were shaking legs on 2006 hit song Slow Dance. The sweet moment between the couple soon turned a little bit awkward as Chrissy’s dress slipped which exposes her front. Her hubby tried his level best to cover her up and finally, Chrissy shielded her exposed cleavage and continued her dance moves. Also, John has dedicated his famous song, “All of Me” to his wife and Chrissy even appears in the music video of that song.